Mast cells are the cells in the skin and mucous membranes that contain histamine. Release of histamine causes the allergic symptoms of hives and angioedema (swelling of large areas of the body). Itching is a common symptom when histamine is released. Anti-histamines are often prescribed to help control this symptom. The immune system normally protects us by making antibodies against foreign invaders such as bacteria and viruses. These antibodies are called IgG and are often referred to as gammaglobulins. Usually, IgG is not formed to any normal body tissue but occasionally, by error, this does happen. If antibody binds to normal tissues it can cause damage to the body or create other disease symptoms. Rheumatoid arthritis is a good example of an autoimmune disease. Antibodies that react with body tissues are felt to contribute to joint swelling and pain. Many other common diseases are caused by autoimmunity such as juvenile diabetes and low thyroid disease. It has been recently discovered that some persons who suffer with hives or angioedema also have an autoimmune disease. 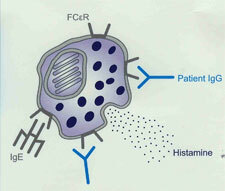 In these cases, autoantibodies have been formed that bind to the Fc-receptor on mast cells. The normal function of the Fc-receptor is to anchor allergic antibodies, called IgE, to the mast cell surface (see the mast cell diagram below). IgE is formed in allergic persons and binds specifically to allergens in the environment. When airborne allergens land on nasal tissues or eye conjunctiva, or are eaten (foods) and enter the body through the intestinal tract they bind to the specific IgE. As a result of this interaction, a signal is sent by the IgE antibody to the mast cell causing it to release its histamine. Histamine release causes the nasal and eye symptoms seen in those who suffer with "hay fever" and can produce hives, angioedema, or even life-threatening symptoms such as respiratory compromise or low blood pressure. Once it has been discovered that the anti-IgE Fc-receptor antibody is present in a patient’s blood, it is no longer necessary to look for any other cause for hives. Why this autoantibody triggers hives only intermittently is unknown. Many people with this autoantibody feel that their hives are more likely to occur when they are stressed. Some women feel that hormonal changes that occur just prior to their menstrual periods also trigger their hives. Some medications, especially aspirin, ibuprofen (Advil), or naproxsen (Aleve) are also more likely to trigger hives. However, Tylenol (acetominophen) does not usually trigger hives or swelling. Once the diagnosis of autoimmune hives has been made, the goal is then to select the best combination of medications to reduce the frequency of outbreaks. Long-term, this autoantibody may go into remission and it may be reasonable to try periods off suppression medications every few month to see if they are still needed. There has been a high incidence of autoantibody to thyroid glands reported among those with anti-Fc-receptor antibodies and it is suggested that yearly thyroid testing be done by the primary care physician.